n 1879, Italians from Lombardy built a chapel for their settlement in southern Brazil. Short on sacred art, they dedicated the chapel to the saint someone offered a picture of, the Madonna di Caravaggio. Today the shrine hosts over a million pilgrims annually, second in popularity only to the shrine of Brazil's national patron, Our Lady of Aparecida. The pilgrimage to Farroupilha on the fourth Sunday in May commemorates an apparition that took place on May 26, 1432 near the Lombard town of Caravaggio (where the famous painter lived in the next century). Giannetta De' Vacchi Varoli was cutting hay in a field when the Virgin appeared. 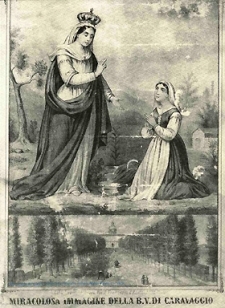 After Signora Varoli told the townsfolk of the Virgin's requests for penance and a chapel, people visiting the field found a new spring arisen, soon proven to have miraculous and healing powers. The apparition anniversary became a day of pilgrimage to the shrine of Santa Maria del Fonte built at the site, and devotion to the Madonna of Caravaggio spread through the region and eventually around the world. Sources: "La Città - Guida turistica - Dal Santuario," Sito Ufficiale del Comune di Caravaggio - Bergamo, www.comune.caravaggio.bg.it; Ghileana Galli, "Brazil, a country like… Veneto!" ItalPlanet, No. 44, March-April 2007, www.italplanet.it/interna.asp?sez=303&ln=0; Santuário de Caravaggio, www.caravaggio.org.br (images).